Installation of the BERNcash wallet (aka BERNcash client) is very simple and straight forward. This tutorial will walk you through the instillation on Windows for example but, the instillation on Mac consists of nearly the same steps and should be useful if you intend to install on your Mac and need guidance. 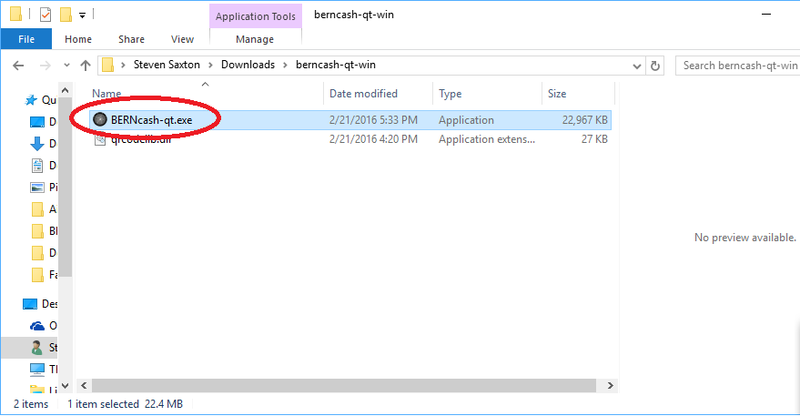 First, you need to download the BERNcash wallet. 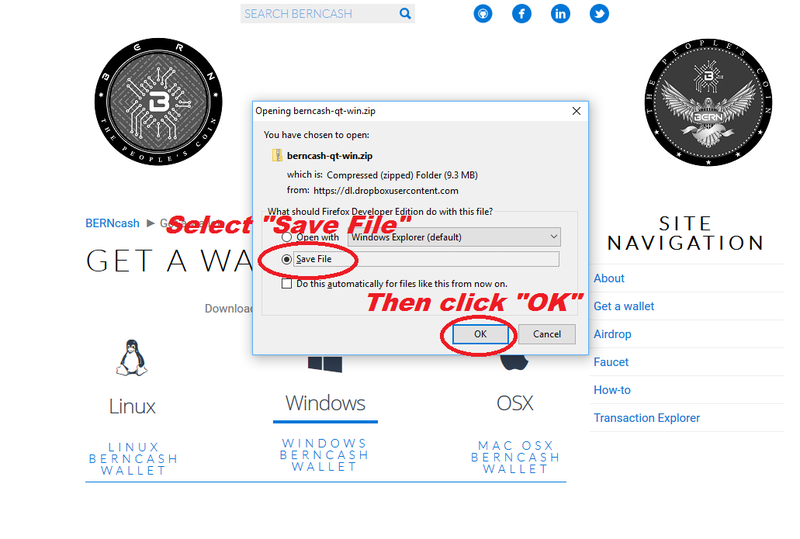 Navigate to the Download section of the BERNcash website and select your Operating System, Windows, Mac, or Linux. 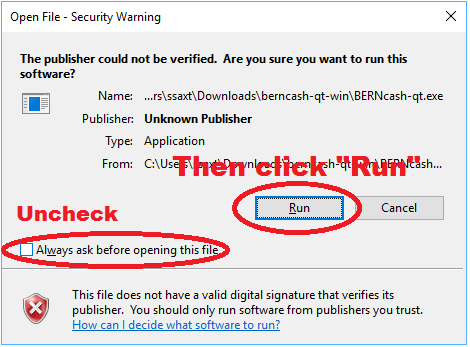 Again, in this example, we will be installing BERNcash on Windows. Simply click on the Windows logo on the Download page. Select “Save” or “Save File” and click “OK” if prompted and your web browser will begin to download. The download will only take a few minutes on even slow Internet connections. Once completed, you will have downloaded a compressed ZIP archive into your “Download” folder. Click “Open” if prompted. If not, you will need to navigate to your Downloads folder. Newer versions of Windows do have native ZIP archive support built into the Operating System but, older versions may need a third-party program to uncompress the files. If you need a third-party application to open the ZIP archive, I suggest 7 zip as it is free and open sourced software. Installing 7 zip should be easy and is outside the scope of this document. For the sake of this example, I will continue as if you have a modern version of Windows and have native ZIP archive support. Once you have the archive open in windows explorer, you should see a window resembling the following image. Click “Extract” in the tool ribbon. Then click “Extract all”. BERN install step 2. Extract files. You then will be prompted with a dialog window asking where you want the files extracted. The default location should be fine but please make note of it for future reference. 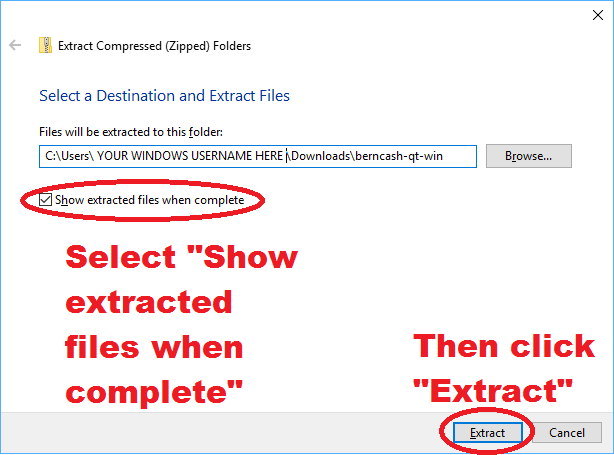 You will also want to check the “Show extracted files when complete” checkbox as this will make it easier for you. BERN install step 3. Launch BERNcash. 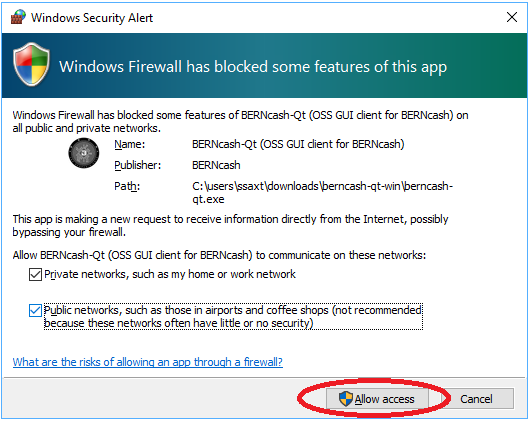 You may also be prompted to allow BERNcash access through your firewall. This is needed as your BERNcash wallet does need to ‘talk’ to other BERNcash wallets. By default, it will allow communication on private networks such as your home. You may wish to enable through firewall access on public networks such as coffee shops or other public networks you visit. To do this, place a check mark by “Public Networks…” also. Then click “Allow access” to apply the new firewall rule. BERNcash will now load. When BERNcash first initially loads, it must synchronize with the rest of the BERNcash network. It may take a while to fully synchronize. 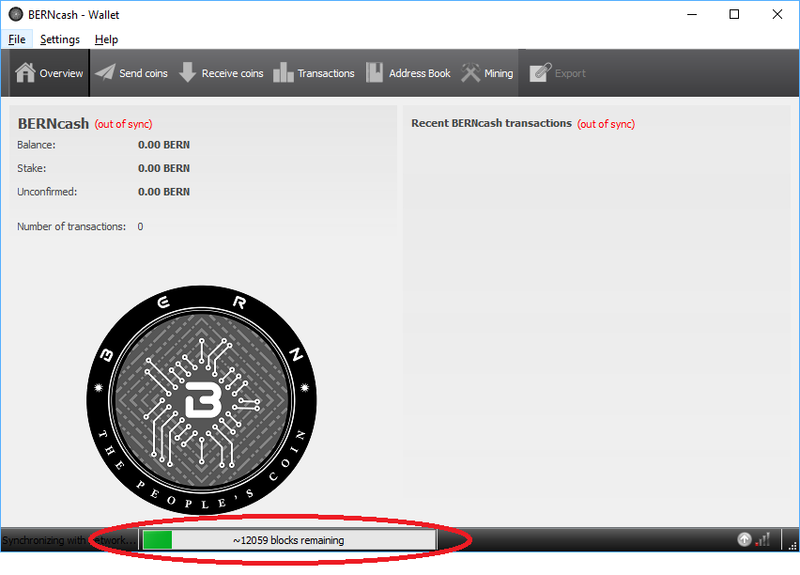 Progress will be indicated with a progress bar at the bottom of the BERNcash wallet window. Allow the BERNcash wallet to remain open so it can fully sync. BERN install step 4. Sync BERNcash. That is it, congratulations! You have successfully installed BERNcash! At this time, feel free to explore around the wallet and familiarize yourself with it. One thing to take important note of is your BERNcash address (aka Receiving address, aka Public Key). Click on the “Receive coins” tab. You will be presented with a list of all your addresses. You will only have one address at this time but you may wish to make additional ones in the future to better keep track of your BERN income. 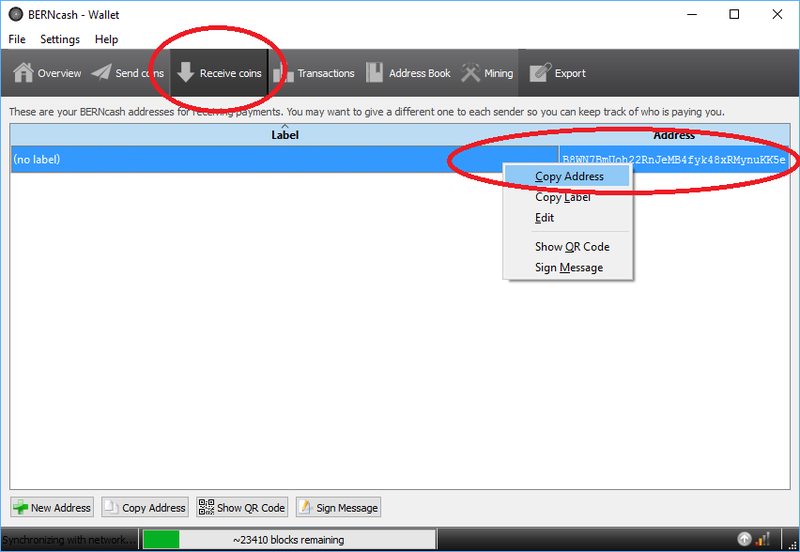 If you right click on your BERN address and select “Copy Address” you can paste it into the BERNcash faucet and in under 24 hours you would see your first deposit happen. 24 hours after that, you would begin collecting the 10% interest on the BERNcash you received. BERN install step 5. Your BERNcash address.